The start line is the line between the green start flag and official boat. 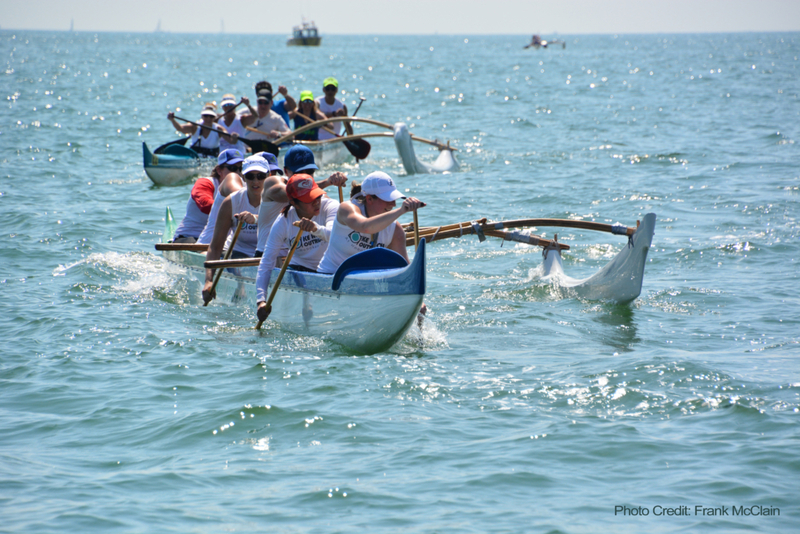 Watercraft (OC-1, OC-2, OC-6, surfski, paddleboard) must be west of the start line at the time of the race start. The starting signals will be as follows: 2 blasts for the two minute warning, 1 blast for the one minute warning, 1 long blast for the start of the race. Where two watercraft are not overlapped (meaning the stern of the leading watercraft is completely clear of the bow of the following boat) the leading watercraft has right of way and the following boat must avoid contact. Where two watercraft are overlapped, both watercraft must offer reasonable clearance for the other and neither watercraft may turn into the path of the other watercraft. There should be no intentional collisions of watercraft by either the lead or passing watercraft. Intentional collision may be cause for disqualification or time penalty. eg: OC-1 drafting an OC-2. Watercraft must turn around Buoy #1 (to the east of the buoy – ocean side) before heading north. Watercraft must travel in a counter- clockwise direction around the turn Buoy #2 (large pyramid buoy.). Watercraft must clear the buoy without the watercraft touching the mark. Where watercraft are clear of one another and no overlap exists, the leading watercraft has right-of-way and the following watercraft must make all efforts to keep clear and avoid collision. Where an overlap between watercraft occurs within 90 feet of the buoy, the watercraft with the inside line to the mark has right of way and the outside watercraft must provide room at the mark for the inside watercraft to turn safely. If the overlap is broken and both watercraft clear each other inside of 90 feet, the overlap rule requiring room at the mark will continue to apply. Where there is genuine uncertainty between racers and officials regarding the existence of an overlap at the 90-foot zone, the presumption will be that an overlap did exist. Any intentional collision in or around the turn could be cause for disqualification or time penalty. Finish – The finish line is the same as the start line. You must obey signals and instructions from safety boats. All watercraft must adjust course and yield to all commercial traffic. Be aware, commercial traffic may be coming from behind you. Look in all directions frequently, especially in the inlet. The inlet is very busy with recreational and commercial fishing boats and jet skis. Jet skis do not tend to observe any right of way rules. Stay outside of the channel (between the red and green channel markers) while in the inlet) if possible. Stay clear of the Brigantine jetty when turning left to head north, and again when turning right into the inlet when returning to the finish line. Failure to adhere to the above, including failure to obey a signal or instruction from a safety boat, may result in disqualification, or, ultimately, cancellation of the event by the U.S. Coast Guard. A team or competitor must be notified as soon as possible after the commencement or completion of the event of any disqualification. Only the Race Director may disqualify a team after consultation with the appropriate officials. The disqualified team will be given the reason(s) for disqualification at the time of notification by the Race Director. Protests must be lodged with the Race Director no later than 15 minutes after the completion of the race in which the incident took place, or after having been advised of the penalty. The Race director will issue a protest form and designated time frame for the form to be completed by the crew captain or coach. On receipt of a protest the Race Director will notify all parties involved in the protest. The Race Director will deliver the protest to the Protest Committee for deliberation. The Protest Committee will hear, investigate, and rule on all protests and any other matter brought before it by the Race Director. Only Protest Committee members, representatives from the involved clubs, race officials and/or other ECORA officials deemed necessary by the Protest Committee to make its determination will be present at the hearing. A quorum of a Protest Committee will be not less than 3 persons who will not be members of any club involved in the protest. Additional members of the Protest Committee may be appointed as necessary by the Race Director. In the event of the issuing of a severe weather, ocean conditions, terror threat, or other safety concern by safety boat captains or other applicable authorities, the race course may be rerouted to the intracoastal course or shortened, and individual heats or the entire race may be cancelled. Course alterations are made in consideration of the safety of all participants and the decision to alter the race course is FINAL. USCG approved PFDs: one (1) for OC-1, surfski, paddleboard, two (2) for OC-2, and six (6) for OC-6. A minimum of two (2) bailers. An additional 5 gallon bucket is recommended but not required. Due to the open ocean venue, spray skirts are strongly recommended but not required. An equipment check will be performed the morning of the race. Watercraft without all of the above required safety equipment will not be allowed to race. Paddlers must be wearing wristbands in order to race (confirms waiver has been signed).